I recently read about the ‘rule’ for eating fruit – how it should be consumed on an empty stomach, between meals rather than with or directly after them. You can read the article here, which Pure Ella posted on her Facebook page this week – thanks Ella! This was news to me, as I often have fruit for ‘dessert’, right after eating – I love to complete a savoury meal with something sweet. And while I do think that everyone has to find a way of eating that works for them (I’m sure some people can eat fruit whenever they like with no ill-effects), I thought I’d give this theory a bash since I struggle so much with bloating, cramps, gas and discomfort. Because I sometimes eat quite often throughout the day, it’s hard to find a two-hour gap where I haven’t touched any food – so for me, if I’m to eat fruit on an empty stomach, breakfast makes the most sense. So this morning, I whipped up a super easy, nutrient-packed smoothie with fresh ingredients and my own homemade coconut yoghurt (recipe here), which adds a little healthy fat and some probiotics too. During the week as I’m dashing off to work, I probably wouldn’t have time to do this, but it was a great ‘treat’ for a Sunday morning. 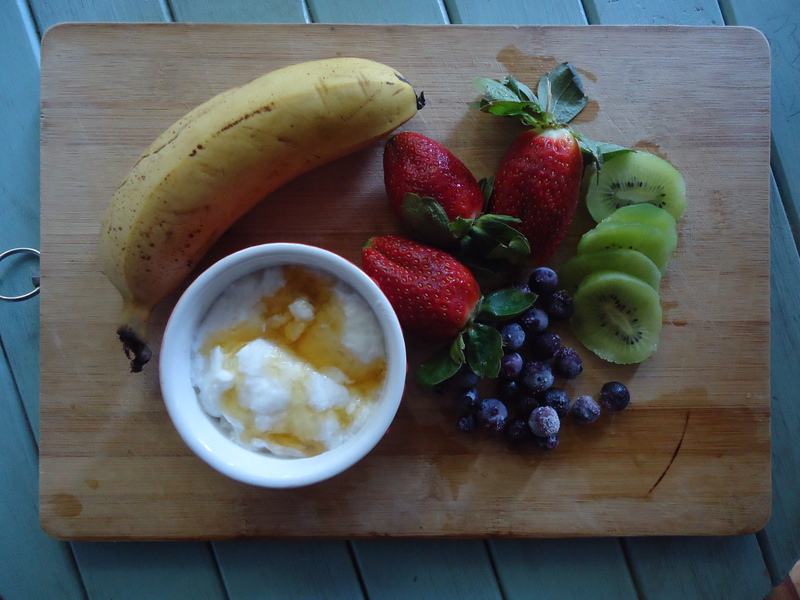 Chop all the fruit into smaller pieces and add to your blender or the measuring cup of your stick blender together with the yoghurt and honey. Blend until smooth and serve immediately. It couldn’t be easier, healthier or more delicious, and if you struggle to get the right amount of fruit or vegetables into your diet, this is a super easy way to get your recommended daily amount in one yummy burst. Enjoy! The problem is that so many people have fallen into a groove of slapping together a toastie for lunch or a pot of macaroni cheese for dinner that thinking about creating a meal without bread or cheese or pasta or sugar (tomato sauce, I’m looking at you) seems virtually impossible. Pasta and puddings are easy, cheap, convenient and delicious to make, and without them… What will we EAT?? Here are some ideas: any kind of meat, basically any fruits and veg you can imagine (with the exception of one or two, like potatoes and bananas, if you’re doing paleo), nuts, nut milks, nut butters, seeds, honey (sparingly on SCD) and, once you start thinking a little more laterally, a ton of amazing desserts and treats made with these ingredients. If you’re doing SCD and you aren’t lactose-intolerant, you can add dairy products to this list too. Of course, if you’ve become accustomed to eating pasta and bread-based meals, as well as the odd pizza cheat on weekends, it can be daunting to make the transition to ‘cleaner’ eating. Yes, it’s a mindshift, but you’d be amazed at how quickly your thinking changes. To help you along if you’re new to this, I’ve put together a list of some of the easier and more popular everyday meals that you can turn into SCD legal or paleo dishes. Traditionally, these are made with milk, wheat flour and butter, so it seems almost inconceivable to make anything resembling a pancake without these ingredients. 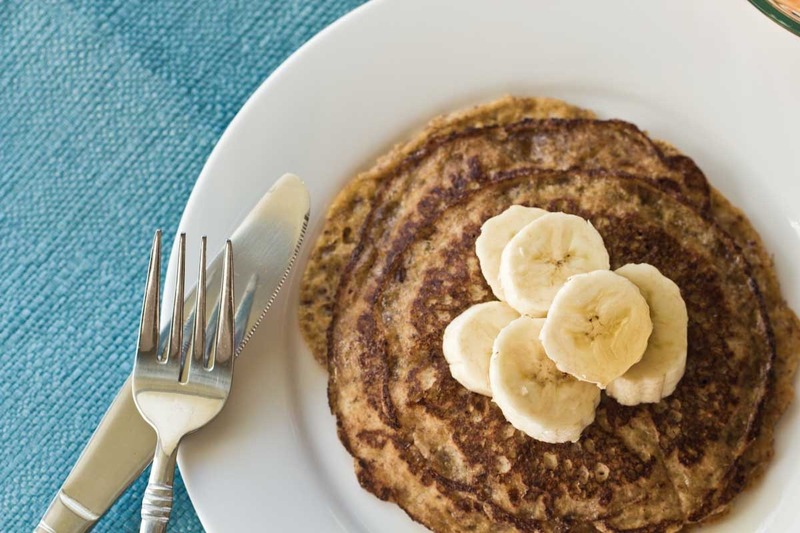 Think again: For SCD pancakes, use eggs, almond flour and coconut oil – try this recipe or this one – or attempt an even easier 3-ingredient pancake that’s super light and quick to make. Bought smoothies are often made with frozen yoghurt or ice cream and loaded with unhealthy sweeteners or sugar. Often they’re just as kilojoule-dense as milkshakes, and we’re tricked into believing that they’re healthy because they have a berry or two thrown in. Make your own paleo or SCD smoothies at home by throwing your favourite fruit into a blender with a dash of pure fruit juice or a squeeze of lime, and instead of frozen yoghurt, use SCD yoghurt, coconut milk or coconut cream. Don’t forget to add a spoon of your favourite nut butter! Get creative and come up with your own combinations – you really are limited only by your imagination (and taste buds). 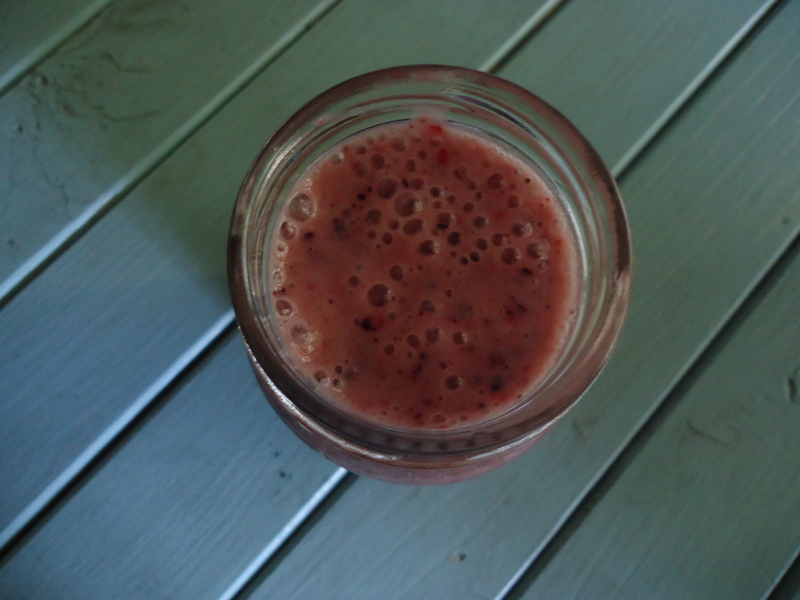 Here’s a collection of great paleo smoothies and shakes to get your creative juices flowing. This is an awesome hack for dairy, grain-free lasagna: Instead of pasta sheets, use slices of zucchini in between your layers of meat. You could also use butternut or even egg-white crepes that mimic the texture of pasta. As for the sauce, use substitutes like cashew cream or cashew cheese. These ingredients may sound totally exotic to you now, but I promise that after making them once or twice, they’ll be old hat. If you told me three months ago that I’d be making my own yoghurt using nut milks and non-dairy cultures, I’d never have believed you. Now I do it once a week, and start to panic when my stock gets low! 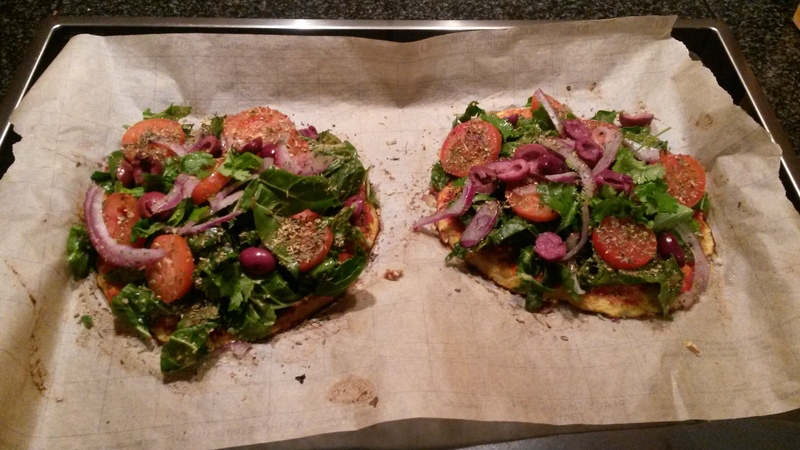 Anyway, here and here are some fabulous collections of SCD/paleo lasagna recipes to try. This one is super easy: The trick is not to be fooled by unhealthy packaged ingredients that you’re so used to adding to your bolognaise. It’s okay to use tomato paste, but make sure it has no added sugar. I’ve just about perfected my bolognaise recipe – it’s easy, affordable and totally more-ish. Here’s the recipe. Instead of spaghetti, serve with cauliflower rice, roast butternut or – if you enjoy the ‘taste’ – shirataki noodles. This is actually a plant product that has a similar consistency to noodles, but zero calories and little-to-no taste (though I definitely detect a vague, odd flavour). It’s quite strange and expensive, but some people like it. Buy it here in South Africa. The only real problem here is the bun, so omit it and, if you like, wrap your pattie in lettuce. Of course, if you’re not doing dairy, omit any cheesy toppings. Bacon is also ill-advised because unless you’re buying organic, it’s usually laden with sugar and unhealthy additives and preservatives. I have an amazing burger recipe that I’m super proud of – try it here. Curries are GREAT for paleo and SCD, because they’re easy to serve without grains, and the recipe doesn’t usually call for dairy. 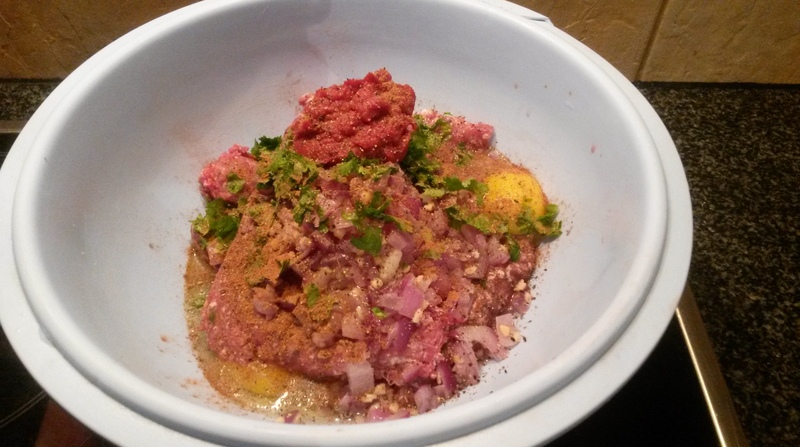 This means that it’s so simple to make SCD/paleo curries. Simply omit any yoghurt and replace with coconut milk or cream, and for sweetness, add a dash of honey instead of sugar. Make sure that any spices you use are good quality and don’t have any anti-caking agents or other additives in them. The best idea is to buy yours from a spice market, if you have access to one, or simply make your own spice mixes from scratch. This is more labour intensive but definitely worth the effort. I’ll post K’s Thai green recipe soon, which ticks all the right boxes. In the mean time, browse this selection of paleo curry recipes. I’m also dying to try this SCD roast cauliflower soup recipe – it’s on my list for this winter (by the way, The Tasty Alternative has the most amazing SCD recipes). There are SOOO many healthy, clean SCD and paleo dessert recipes out there – do a quick Google search to see what I mean. Things you’d never even imagine existed. So you never need to feel like you’re missing out just because you can’t have caramel whip or cream cakes. In fact, because these desserts are so kind to your belly, you’ll finally get to enjoy a sweet treat without the awful after effects you’re so used to experiencing. Here’s a baked apple crisp I made last weekend that was very easy to throw together, and enjoyed by everyone who tried it. My favourite review came from my mom, who said, “You can actually taste how healthy it is.” But yet, super delicious. Win! Happy cooking, guys – and don’t be afraid to experiment! 100 days! I’ve reached my goal! Today has been a whole day of celebrating this milestone, the SCD-legal way! It started with two big bowls of biltong for brunch – it’s one of my favourite delicacies but I haven’t been able to eat it on SCD, because a) it’s raw and only allowed on phase 5, and b) it’s usually covered with spices that I hadn’t introduced before now. The butchery downstairs sells amazing biltong so I spent a small fortune there and gleefully skipped home with my bounty. 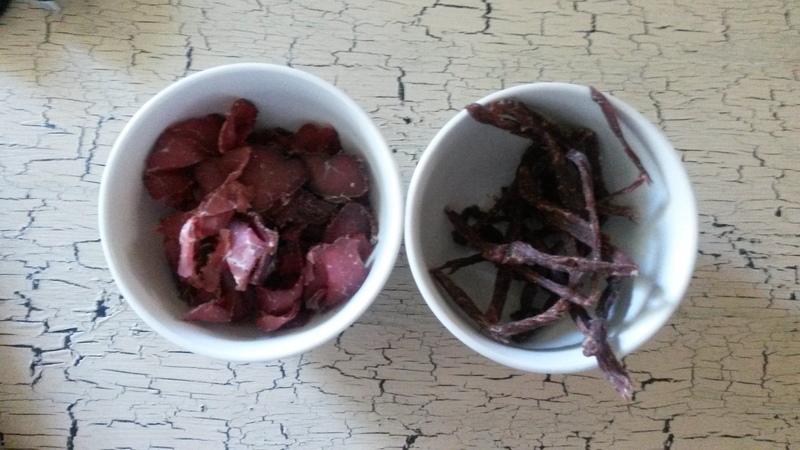 Biltong is a little like jerky except much, much better and way more delicious. It’s raw, highly spiced and salted meat that is left to dry. It’s K’s absolute fave, and since she was leaving for Kuala Lampur today, I wanted to include her in my 100 day celebrations before she left – which meant I incidentally started phase 5 too. Next up, I attempted to make some Larabars, which actually just turned into bliss balls without the coconut. I used cashews, dates, vanilla extract and spices, but I’m taking great care with them because of my previous bad reactions to nuts. Finally, after dropping K off at the airport, I came home and made myself some cauliflower pizzas for supper. The base was made of riced cauliflower (one head, steamed), mixed with 2 whole eggs and a heaped tablespoon of coconut flour. Next time, I’ll use the egg whites only, as the base tasted quite eggy. Also, it didn’t firm up brilliantly – it remained quite soggy even after 15 minutes at about 180 degrees C. I think the cauliflower – as well as the toppings – were too wet. I topped the bases with tomato paste, dried basil, oreganum and Italian spices, and then a whole whack of fresh veggies: fresh tomato, olives, onion, garlic, coriander (cilantro) and spinach mixed with home-made tomato sauce. I baked it for a further 10 minutes, then topped it with avo slices. It tasted delicious but it was very, very soggy! Any tips for making a crispy cauliflower base without cheese? For dessert, as always, it was a fresh batch of SCD yogurt (recipe here) drenched in honey. Life is good and my belly is HAPPY! 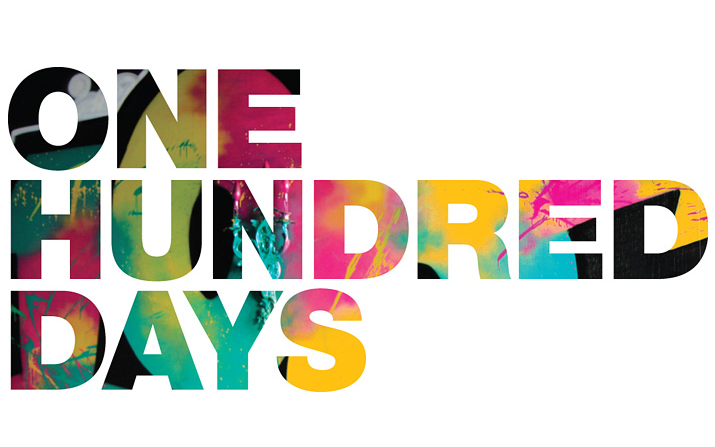 I’ll keep posting and over the next few days I’ll share my thoughts on 100 days on SCD. 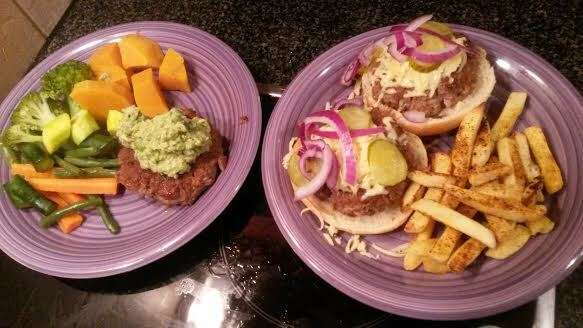 Here’s the recipe I promised you for the AMAZING burger patties I made the other night. They’re SCD/paleo/GAPS, super easy to make an they’re knock-your-socks-off good! How do I know this? K said, “I feel like I’ve just eaten at a restaurant” after finishing hers – which, let me tell you, is high praise! 1. 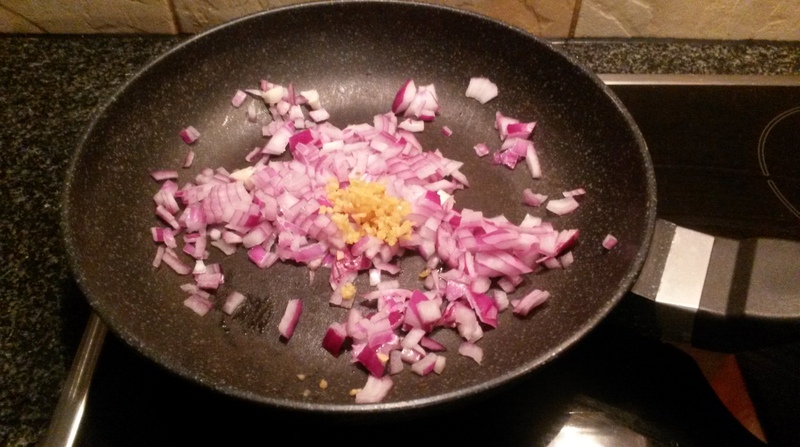 Add your onion and garlic to a pan and soften for a few minutes. 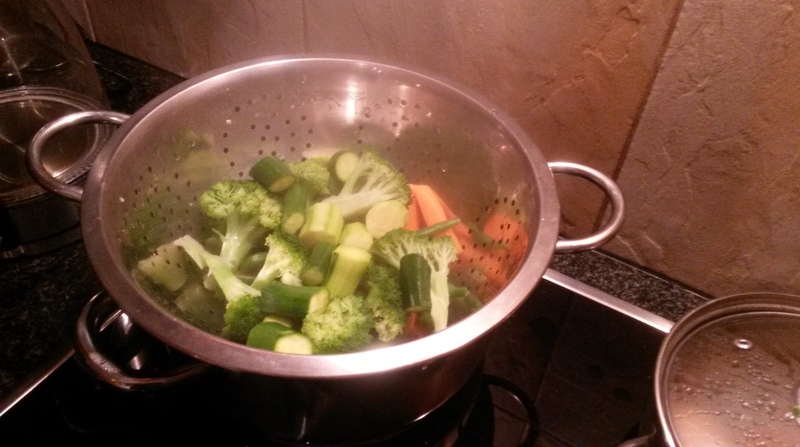 This is not essential but it’s a good idea for anyone who requires their veg fairly well cooked. 2. Meanwhile, place the rest of the ingredients, minus 1 handful of coriander, into a large bowl and add the onion mixture once ready. 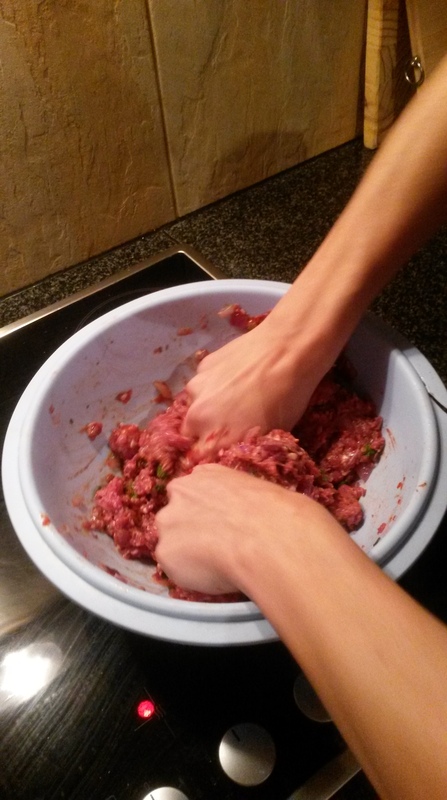 Get in there with your hands and work all the ingredients together, mixing well. I asked K to add a few more dashes of salt and pepper as I mixed. 3. Now shape your meat into patties. 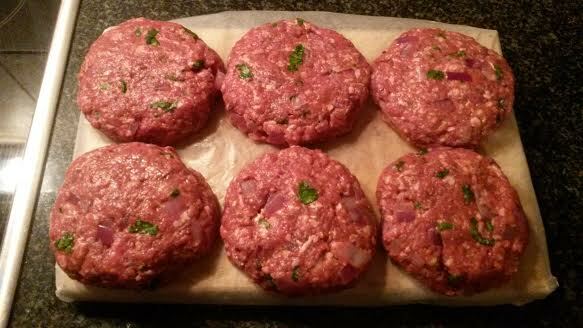 I made 6 big patties, but you could easily turn these into 8 or 10 smaller ones. Place them on a lined chopping board or plate, and allow to firm up in the fridge for a few minutes. This probably isn’t essential, but I gave mine 20 minutes of chill time. 5. Add a drop of coconut oil to a pan, heat to medium, and add your patties. I fried mine in two batches. Because I hate using oil (it makes me a little queasy), I added dashes of hot kettle water to the pan whenever it needed moisture. I know that purists would recoil in horror at this, but it kept the patties so moist while still allowing them to brown. Cover with a lid while cooking, and cook for about 6 minutes on each side, depending on thickness. While the meat is cooking, make your guacamole. 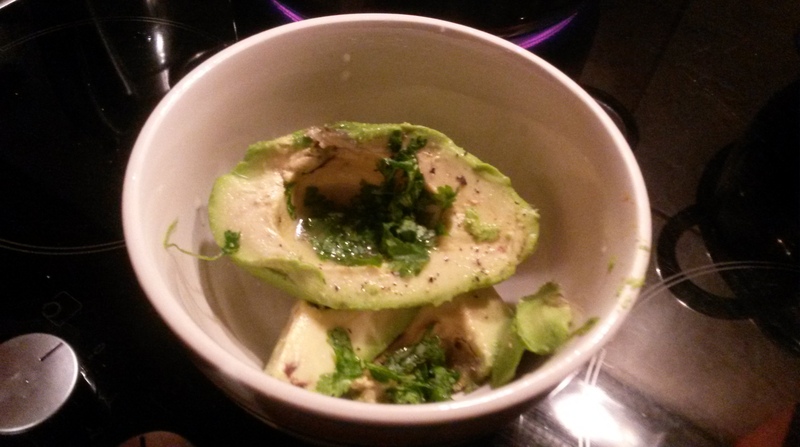 Place the avo and coriander in a bowl, drizzle with lemon juice and add a good crack of salt and black pepper. Mash it all up together with a fork. K’s plates always look a little more fun than mine! 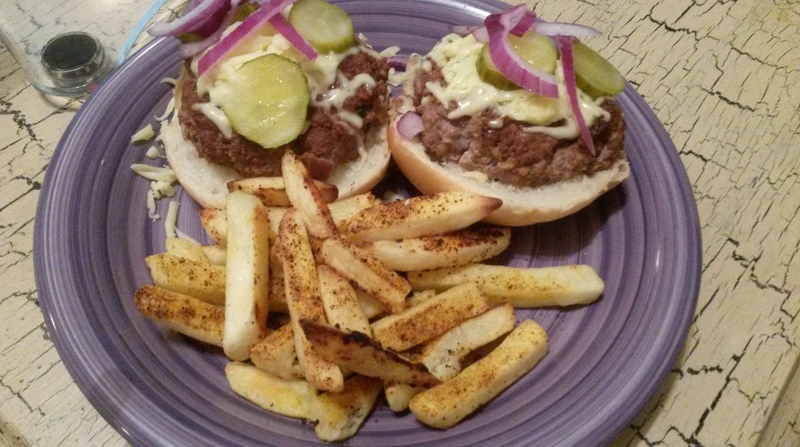 Day 96: The most amazing 100% SCD burgers! Just look at these babies! I made them tonight out of a recipe I concocted in my head, and the results were far, far better than I expected for a first attempt. I ate the patty with home-made guacamole and steamed veg on the side, and K – oh she of healthy gut – had hers drenched in cheese, topped with red onion and gherkin, and served on a bun with chips on the side (neither of which are SCD legal of course). Cheese – dairy – is legal on SCD but I haven’t covered it much on this blog because I’m lactose intolerant and hence avoid it at all costs. I haven’t introduced any new foods in a while, so tonight I experimented with spices (which I finally feel comfortable to do now), and I also ate a few slices of gherkin, which I’ve always loved. I need to keep introducing foods but I’m making such amazing meals from my existing options that I keep forgetting! It’s really late and my internet connection is a little cranky so I’ll post the recipe tomorrow. 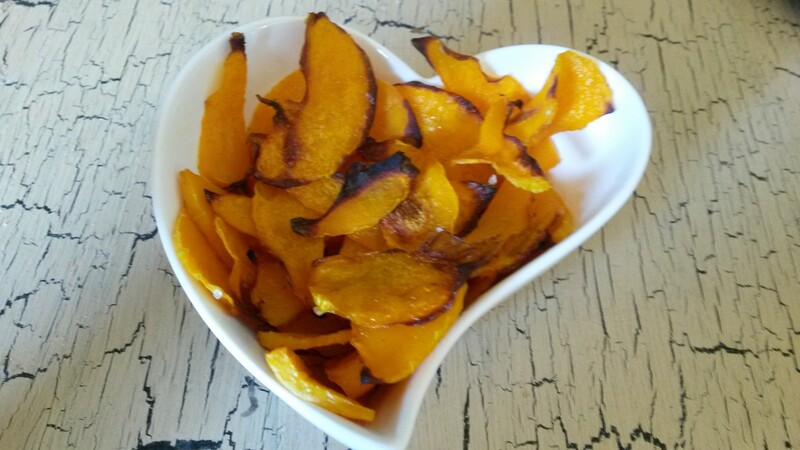 I found a recipe for butternut chips ages ago, but I’ve had to wait until I was at the right phase of the diet before trying them. Today was the day! Although they’ll require some perfecting, they were pretty good. 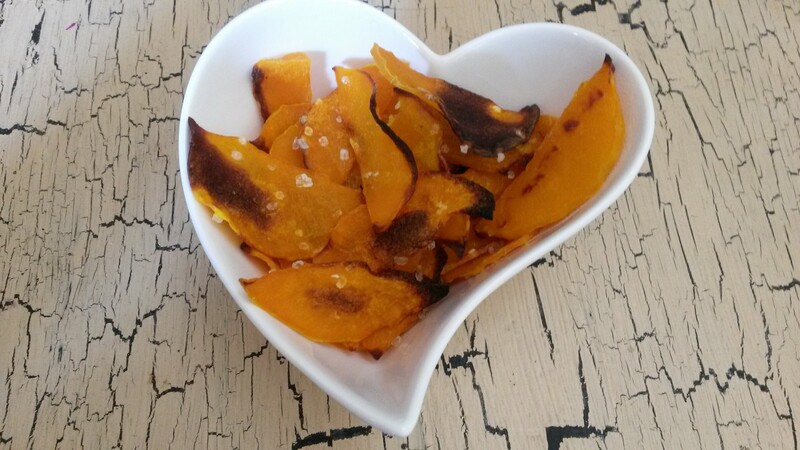 Next time, I think I’ll use a lower heat setting on the oven and cook them for longer – I think that might help them to get even crispier without charring. 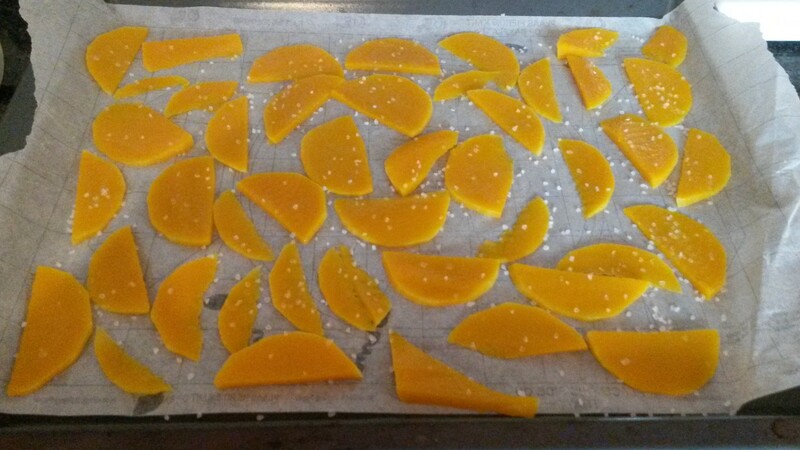 Peel a long, thin butternut and cut into very thin half-moon slices (2mm or so). I didn’t use the ‘bulb’ part, but if you do, remove the seeds. 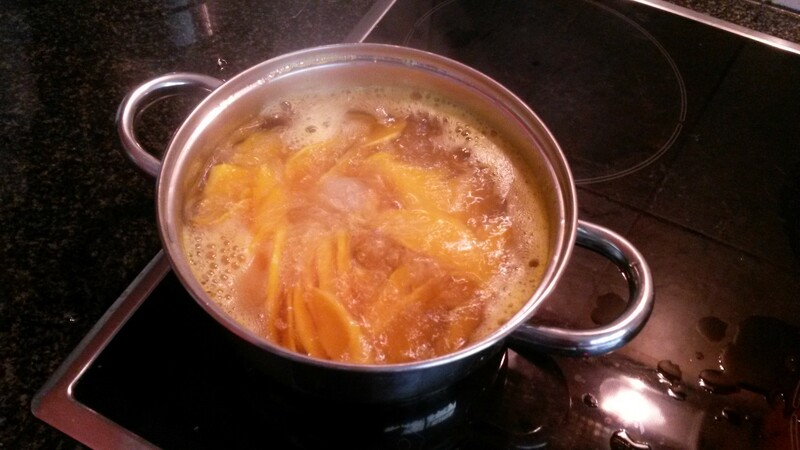 Boil the butternut in batches for a minute or two, until just softened. Remove from the pot with a slotted spoon. 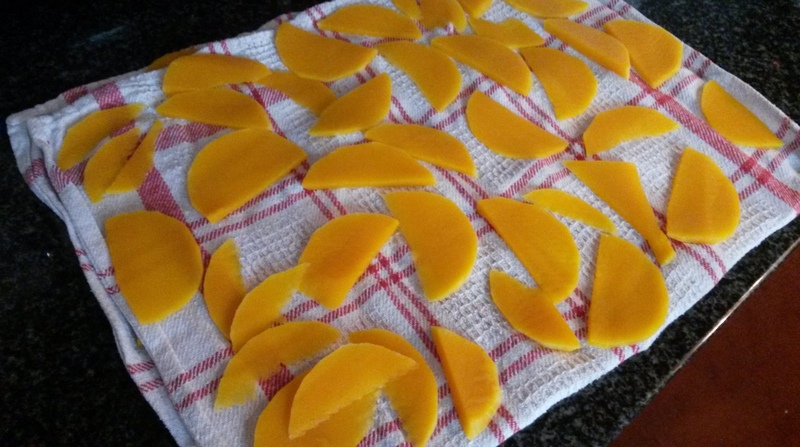 Place the butternut pieces onto a clean dishcloth in a single layer and allow to dry completely. I patted mine dry with paper towels. Place in a single layer on a lined baking sheet and brush with oil of your choice. I used coconut. Season with coarse salt and anything else you fancy, like cracked black pepper, garlic or onion seasoning, or fresh herbs like rosemary. Bake at 180C for 10 minutes, then check on the chips and remove any that are already cooked. I left the remainder in the oven for another 10 minutes. On phase 4, you can introduce blanched almond pieces. This afternoon, desperate for some sort of ‘fun’ snack, I decided that today was the day. 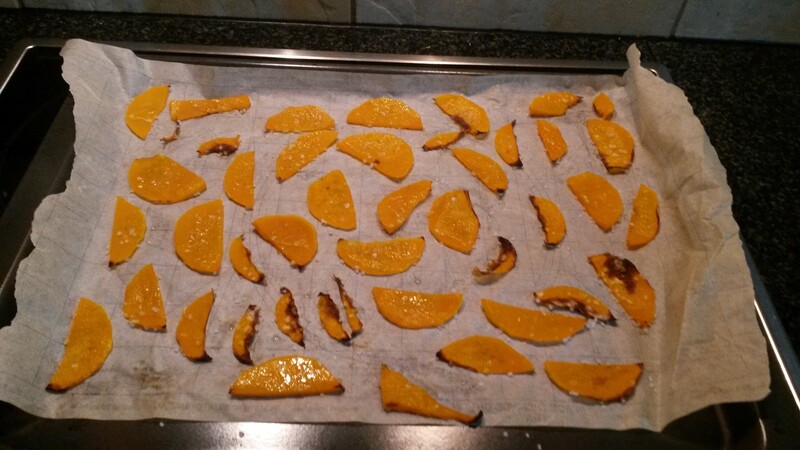 I didn’t have blanched… or pieces… so it ended up being whole almonds in their skins. However, I introduced almond pieces months ago when I used unstrained almond milk to make yogurt. I have also been symptom-free for about 5 months now, so technically long enough to reintroduce nuts to my diet. I of course couldn’t limit myself to a handful or two so I may have overdone it. However, due to my lack of self-restraint when it comes to nuts and nut butters, I’ve decided never to buy nuts for myself, but only to eat them if someone else buys them for me (that’s not a hint, guys!!). My dad bought me this bag but nuts are something I’m seldom given as a gift so I think this is a good strategy. I am actually okay today after last night’s restaurant meal, but my tummy had a bit of a wobbly after the butternut chips, sending me to the loo with very runny stools. 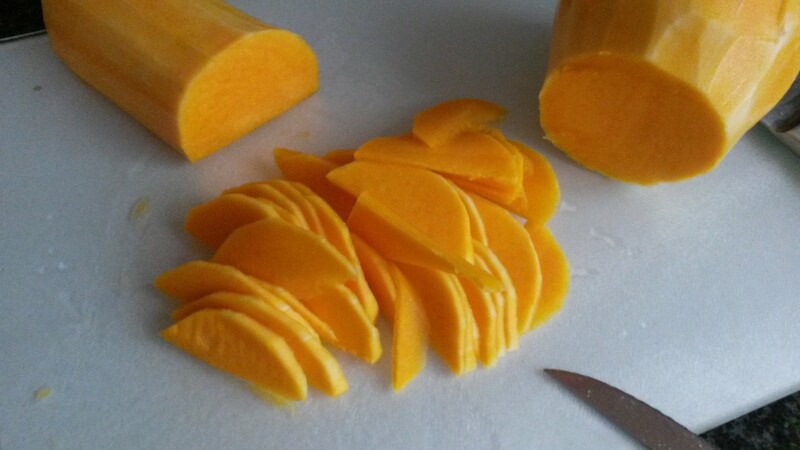 I tolerate butternut well so perhaps it was the coconut oil that I used. To be honest I’m not feeling amazing now so perhaps today has just been too much fat, too fast. In my typical style! I have a weird burning sensation in my abdomen. Does anyone else ever experience this? Today marks 90 days on SCD – the goal I set out to achieve based on the challenge in Surviving to Thriving. Jordan Reasoner and Steve Wright – the authors of the book and founders of SCDLifestyle.com – used the specific carbohydrate diet (SCD) to help heal their guts after being ravaged by IBD, and continue to survive – and thrive – on the diet today. I came across this diet last year, after researching alternative ways to fight my ulcerative colitis. I was newly diagnosed and my symptoms were under control thanks to steroids and chronic medication, but I knew I wanted to take a more active role in healing myself, and I knew that diet was integral to that. Most importantly, I knew I didn’t want to be on meds for the rest of my life. Fast forward to January 2014, and after reading the book, I finally made the commitment to do its 90-day challenge. And here I am, 90 days later, having followed it to the T (albeit cheating once!). I started this blog for others who may have wanted to take up the challenge but who, like me, were unable to find any resources that explained, on a day-by-day basis, what it would be like to be on this diet. After all, the idea of the diet is terrifying! It’s extremely difficult, it takes a TON of patience, willpower, perseverance and commitment, and it’s definitely not easy – at least at first. Apart from anything else, knowing that you are taking an active role in your own health, and discovering that you have the stamina to stick with something really hard, even in the face of daily – hourly – temptation – gives you a sense of accomplishment that is hard to beat. Many of us fighting IBD got here due to poor diet – at least in part. I don’t know about you guys, but prior to SCD, I never met a sweet treat I said ‘no’ to. In fact, I discovered on this diet that saying ‘no’ is the best yes you can give your body (read about that here). I realised that I needed to take responsibility for my health, so that if I ever end up facing surgery one day, at least I’ll know I did everything in my power to prevent it. How could I allow myself to continue on my unhealthy path knowing that I might be throwing myself under the bus? Moreover, I really hope to get off the meds one day – who wants to spend their life on Asacol and steroids? After researching SCD for several months, I decided it would be worth a try – thousands of people swear by it. I finally took the leap and I’m so glad I did. Did SCD work for me? SCD has definitely helped to reduce some of the discomfort I experience, but more to the point, it’s helped me to pinpoint what is causing it (veg, mainly. Sob). It’s also helped me to look more closely at some of my ‘less ideal’ eating habits, like binge eating, over-eating at meals, eating too fast and not paying careful attention to everything that I put into my body. It’s allowed me to overcome my fear of flares. As you’ll know if you have IBD, the thought of flares is terrifying: you never really know when they’ll hit, but you may know that certain foods can trigger them. On SCD, I’m not eating ANY foods that are known to cause my flares (this is different for everyone). It’s great to not live in fear of the next flare striking. It’s also taught me (out of necessity rather than choice!) how to make the most amazing foods at home – like nut milks, 100% natural meals and YOGURT! I make my own yogurt, guys (recipe here). I mean, that’s insane! It’s taught me how to pay even closer attention than I did before to food labels; it’s taught me how much crap can be found in foods that we’re tricked into believing are good for us. And it’s opened up a whole new world of fresh, natural, organic foods (including desserts!) that actually help to heal my body as I’m eating them. Has SCD ‘healed’ me? Well I can’t say at this stage. I’m still taking my meds, as it would be silly for me to come off them without the green light from my doctor. However, at my last check up in February, there was ZERO sign of inflammation – something that I’ve had since 2012! Also, I was really hoping that SCD would help me overcome bloating, but that’s still a work in progress – as is the quality and consistency of my BMs. But again, this is okay – there’s no blanket cure that works for everyone, which is why any diet such as this must be tweaked over time to meet your body’s needs. I’m going to do another 10 days on SCD, and then I’m rewarding myself with a well-deserved holiday to Malaysia and Bali (actually, the timing is purely coincidental, but I like the way it worked out). I plan to transition to a paleo diet, as I feel that my body copes better with meat and protein than with veg and carbs, and also, I like the idea of paleo – I’m hoping it’ll work for me. It’s also grain, dairy and refined sugar free – items I intend to avoid indefinitely (plus I’m lactose intolerant) – and I love that it’s so clean. When I get back from Bali, I’m hoping to turn out whole apartment into a paleo zone! It’s going to be so much easier if we’re both following the diet. Did I cheat today, on day 90? Nope! Although I did do something naughty that I warned you guys about waaaaaaaay back in the early days: I ate at a restaurant (probably only the third or fourth time I’ve done this on SCD), and I didn’t ask them to cook my food without seasoning (here’s what not to do at a restaurant if you’re on SCD). I ordered steak and veg, and luckily all the vegetables had already been added (successfully) to my diet: zucchini, green beans, broccoli and spinach. 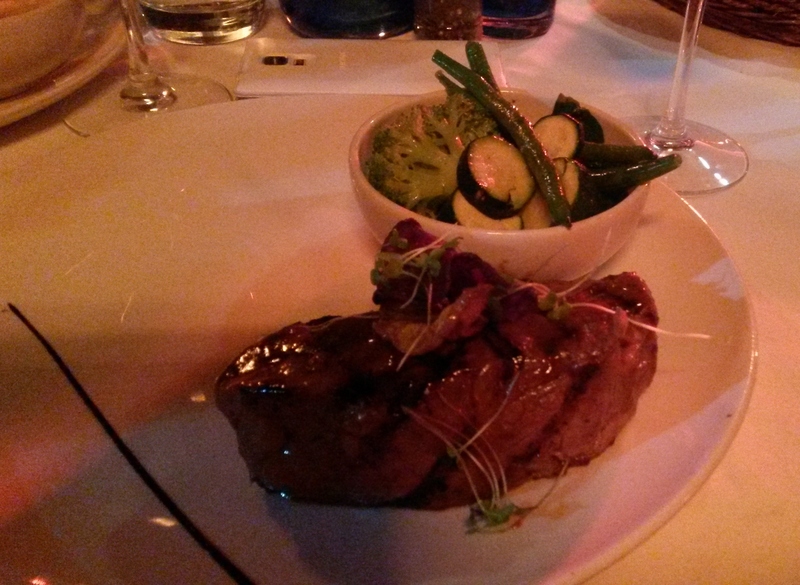 The steak, too, was fantastic, though it all came with seasoning and I suspect the veg had butter on it – eek! Bear in mind that dairy is totally fine on SCD after about 30 days, IF you can tolerate it. Butter is SCD legal, as are certain cheeses. And of course, you’ll see the stem of my wine glass – we had the most delicious merlot to accompany our meal, and I toasted to the final 10 days on the diet. So cheers to that! I’m coming to the USA!